Over the holidays I picked a mild day to take a photo walk around Montréal’s Hochelaga-Maisonneuve district looking for doors for this recent Thursday Doors post. 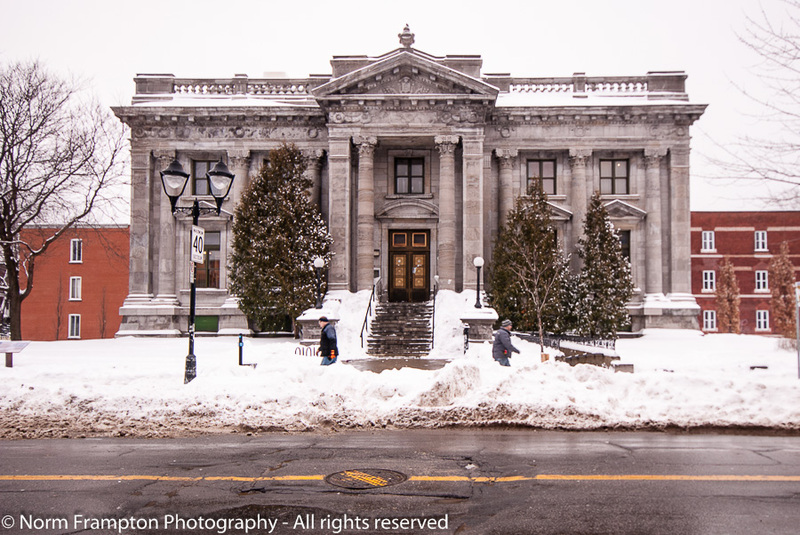 Located at 4120 rue Ontario East, la Bibliothèque Maisonneuve has a storied history that dates back to the days before the now defunct town of Maisonneuve was annexed by the city of Montréal. The tourist information billboard out front explains to visitors that before being incorporated as a municipality in 1883, the village of Maisonneuve was just another quiet farming community on the island of Montréal. The village was located several miles east of the downtown core, just outside of Montréal’s territorial limits of the day. Thanks in large part to the long stretch of deep water St-Lawrence River shoreline that allowed for the construction of one of Canada’s largest cargo ports, Maisonneuve’s local landowners went on an unprecedented development spree. Port access to ocean going vessels meant access to raw materials, offered a departure point for finished goods, and gave nearby factories and merchants a doorway to the world. Within two decades the newly incorporated town of Maisonneuve had an industrial output that was second in the province of Québec, (its neighbor Montréal was first), and fifth in all of Canada. People flocked to Maisonneuve by the thousands to work in the tanneries, textile plants, slaughterhouses, a major tobacco plant, and a sugar refinery, to name but a few of the hundreds of employers that sprung up in those prosperous years. 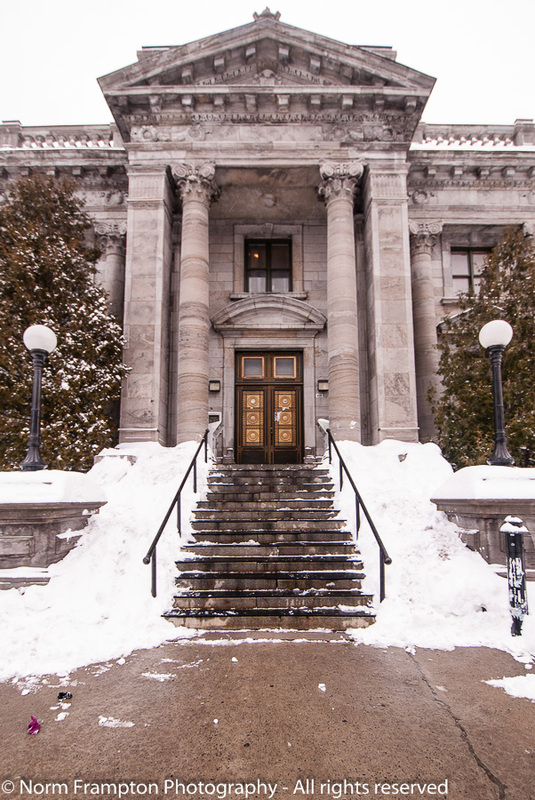 Built between 1910 and 1912 and designed in the Beaux-Arts style this now-protected heritage status building served as the Hotel de ville (City Hall) de Maisonneuve. 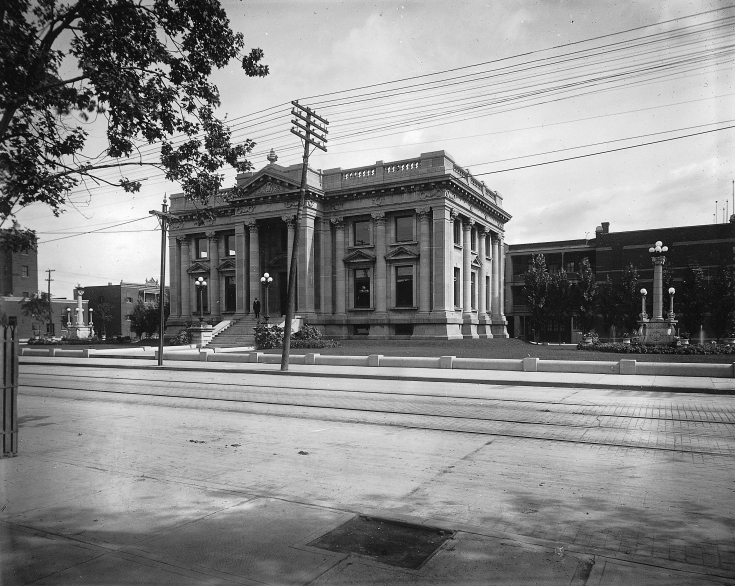 Unfortunately, due to the growing public debt from all the spending to finance such rapid expansion, the town ran out of money and was annexed by Montréal in 1918. Many factories closed or moved away and took their jobs with them. The community stagnated and slowly went into a decline that it has never quite recovered from. Since Montreal already had a grand city hall of its own, it certainly didn’t need another one. Luckily however, someone did see the value of this beautiful structure, so rather than tearing it down in favor of some new development project, the building changed hands several times and served multiple vocations over the years. I made my way up the front walkway thinking about all of the incarnations this wonderful structure had been through over the last 9 decades. At first after the annexation the building was used as a milk pasteurization lab and then in 1926 it became the Université de Montréal’s Radium Institute, which was affiliated with the Marie Curie Radium Institute in Paris. Then in 1935 the building was converted into a small cancer hospital. Finally in 1981 the city decided on its current vocation, converting it yet again; this time into one of the east end’s busiest and most beautiful public libraries. It was closed due to the holiday when I was there but I’m looking forward to going back to explore the interior of this place some time soon. 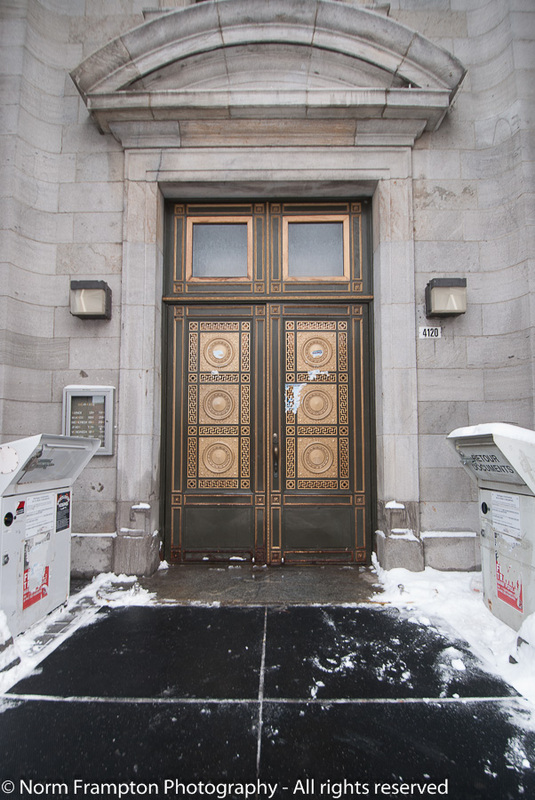 This entry was posted in Photography, Thursday Doors and tagged Blogging, Canada, Doors, Historic Architecture, Hochelaga-Maisonneuve, HoMa, Montreal, Photography, Québec, Thursday Doors. Bookmark the permalink. Here are mine a little bit late but at least before next Thursday. Sounds like a great idea Norm. Enjoyed the doors here and on the other blogs. I posted my first doors, but am too late to join up with the linky tool. Next week, maybe! Entries are open each week from early Thursday morning to Saturday at noon, eastern North American time. Feel free to join us whenever you have nice doors you’d like to share. That’s a real beauty Norm, all the better for the snow covering! Amazing! I guess it’s global all this strange weather – here it feels like spring already – I think some of the birds are confused and the fruit trees too! What a majestic building Norm! I especially love the perspective of the third photo. Thanks for the kind words. I really had fun with this one. Library seems like such a natural fit doesn’t it? I had no idea it was built for something else until I started doing the research. We are so lucky to be able to research with Google, it turns up such interesting information. Steel and bronze- wow, they were serious in making this a historic building (of course, next to the renaissance front:) ) Am enjoying it every time I come here. Wow. Gorgeous! So lovely that they’ve preserved the building! The photos are absolutely wonderful and I loved the fascinating historical background you provided. Thanks Charlie. It was both fun and very educational for me. Those doors are amazing. Not a lot of buildings left with that kind of doors. Thanks Michelle. I had a lot of fun learning about the building and the history of the community. I bet! It’s nice to see cool and pretty doors, but an even bigger bonus when that door has a story. An absolute gem of architecture indeed. It really is. I can’t wait to go back to check out the interior. Interesting history and decorative doors. Beautiful doors, Norm 🙂 I’m looking forward to seeing the photos when you do get to go inside. Thanks Helen. I’m looking forward to it myself. I hope so. Its heritage building status should help preserve it for generations to come. It is beautiful. I can see it in some of those vocations, but it HAS to be a library, nothing else fits it as well. Thanks Trent; I totally agree. I’m looking forward to seeing the inside as well. What a beautiful building! Reminds me of the old main branch of the Louisville Public Library. They expanded with an addition that, to my eyes, is one of the most hideous structures I’ve ever seen, but they kept the old building. I’ll have to get over there and take some pictures. Thanks for the library, Norm! I love ’em! The fact that it’s a library makes it beautiful in my eyes. The actual beauty is a complete bonus! Also – it looks stunning in the snow! This is so beautiful! What an interesting past it has and the stories this building could tell. I love that it is now a library. Perfect! Many stories to tell indeed, but I think it has finally found the right vocation. I’m looking forward to going back for a look inside. I could spend hours in a library like that! Fabulous door and I love the history with it. I am so glad this magnificent building survived and made it back into public service. Also glad that along the way, no one decided to replace those doors with the boring glass and aluminum panels that decorate so many public buildings these days. Great find Norm – thanks for the history. Thanks Dan. I had so much fun researching the history of the building and the community. Wonderful door! Makes curious what’s inside. What beautiful doors and an interesting building. The snow is a contrast to my contribution this week. Thanks. Early February and with this wonky winter we’ve been having that snow’s all gone now.